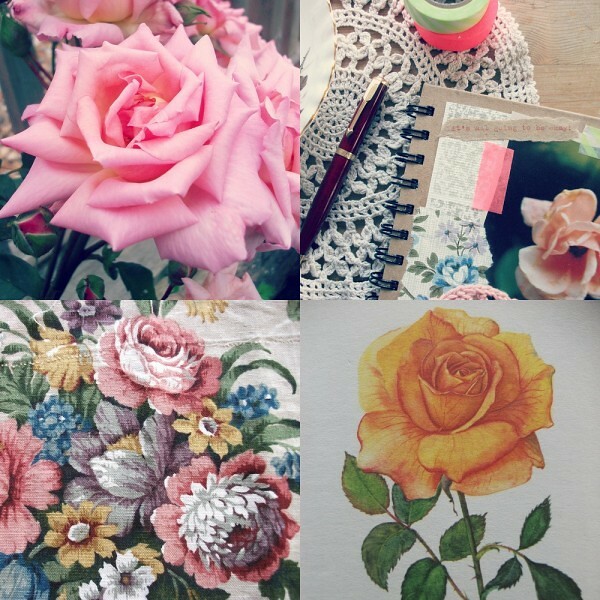 Each autumn I find myself inspired by the autumn roses. made even more lovely by their beginnings of faded autumn decay. I love the name Autumn Rose. I think if I were to have had a little girl I would have called her Autumn Rose, is that not a lovely name? But instead I will offer up this name, put it out there if you like, make something new. and want to possess them in a way I cannot. 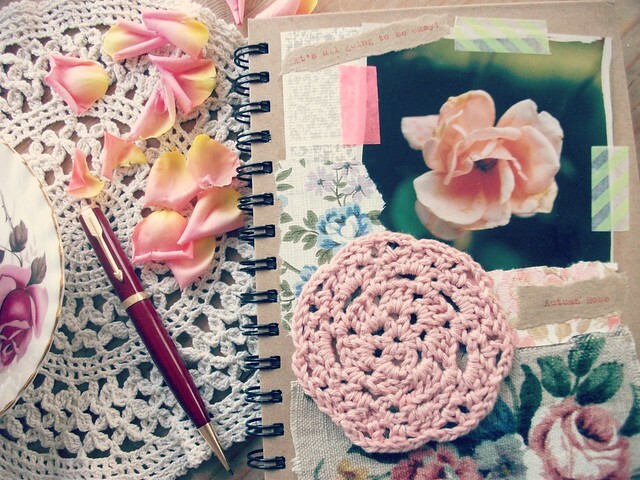 beautiful material and pieces of crochet has been growing for a while. ........and I wonder if I am infact one who journals? I know I am a collector of pretty things. and the scribbler of good advice, and I do love to remember a good quote. so I think this journal will become a place to collect my quotes and scribblings together. If you could see my wall of post-its, you'd understand. ........and I'm really rather happy about that. Brother de luxe is very at home here! "some changes look negative on the surface but you will soon realize that a space is being created in your life for something new to emerge"
I'm really trying to go with that. Before October is over I must show you this months screen saver picture found on geninne's art blog. Her birds and artwork are lovely and I actually kept her December screen picture up for months. I think the same may happen with this one too. Another pink glow in my life! A lovely, thoughtful, autumnal post, Heather. 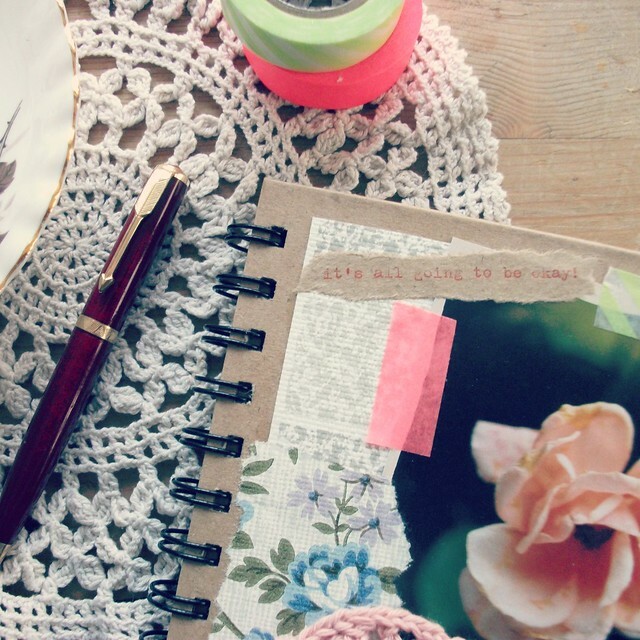 I love your collage & journal - just perfect for keeping quotes and memories. Hope you've enjoyed some sunshine in your part of the country today, it's been beautiful here. I like the name Autumn Rose very much indeed! My youngest daughter's third Christian name is Rose and I keep it close to my heart. That quote is so true. When I look back on my life I realise in retrospect,, of course, that épisodes which seemed very dark did indeed with time give way to beautiful changes. Warmest wishes for a creative autumn to you, dear Heather. And thanks for linking to Geninne's Art Blog, a lovely find indeed! Your photos look great and I like the look of your journal. I love faded autumn roses too, really beautiful. I love your sketchbook. I love the journal cover. What a great reminder! 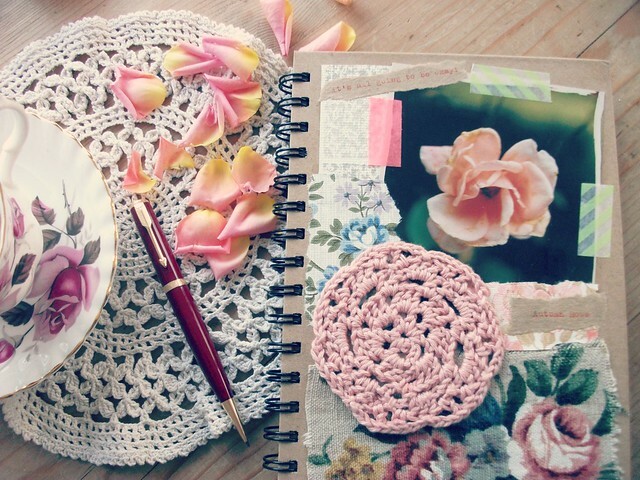 I love your journal, the paper and the washi tape... so lovely and so feminine. I think your journal would still be a journal with bits and pieces and post it notes... even photos or clippings... whatever describes you! Stay dry in the up coming storm. I think all creative bloggers are just journallers by another name. Lovely post. I think I need to jot that quote down somewhere too! Love your journal page. Love it all... the name, the post, the journal, the photos, the cushion, the typewriter -- simply perfect! Such a pretty post, I really enjoyed it. 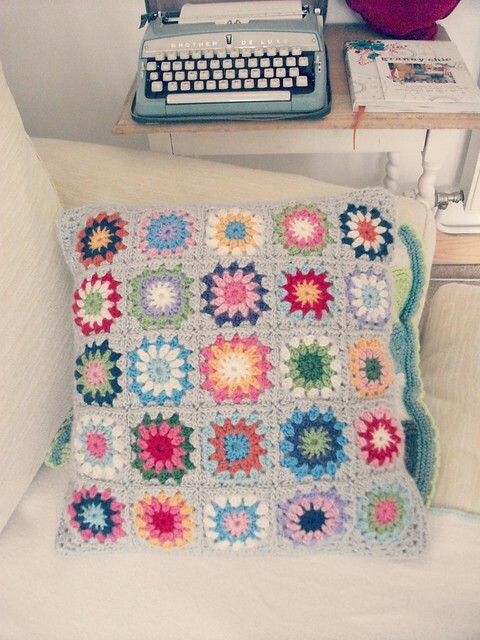 I loved crochet cushion. Its really nice..